The Quandelacy family of the Zuni pueblo has a tradition called the Grandmother Necklace which is a fetish necklace made of birds and animals – one animal carved by each member of the family and presented to Grandmother or Mother. How big is your family? Or your extended family? Native American Necklaces – What is heishi? Heishi means shell and in the past, referred to pieces of shell that have been drilled and hand rolled or ground into bead shapes and strung as necklaces. With the reduced availability of some shell materials, the modern Native American artists also use hand made beads of other natural materials including stones when making heishi necklaces. Heishi originated with the Santo Domingo and San Felipe Pueblo Indians of New Mexico. That’s why many people refer to this type of jewelry as Santo Domingo jewelry. Although all of the items we sell in our Native American Jewelry Store are hand made by Navajo, Hopi, Zuni or Rio Grande Pueblo Indian craftsmen and women, there are many inexpensive imitation heishi items for sale elsewhere that use man-made materials and are produced by non-Native Americans. So, like many other things, you get what you pay for. If you want an authentic, traditional heishi necklace, this is the type you should be looking for. The shells most commonly chosen for heishi include penn shell, olive shells, spiny oysters, mother-of-pearl (MOP), and melon shell. Coral is also used as well as stones such as lapis, turquoise, jet, pipestone, and serpentine. Heishi beads are made by slicing the shell or stone into uniform strips. Then the pieces are nipped into small squares. Each square then has a hole drilled in it. The squares are strung, each material being strung in a separate group. The strings of squares are smoothed and rounded by grinding and rolling the beads. Once the beads have reached the rough ground round stage, they are ready for sanding. The beads are smoothed and shaped using sandpaper. The string of finished material is washed and dried in the sun. Then they are polished on a leather belt. Now the artist strings the various heishi beads in a unique design. Authentic handmade heishi, although smooth and of uniform consistency, will have variations among the beads. There will be a variation in color and thickness or there might be a slight imperfection in the shell or bead. This adds to its unique appearance. 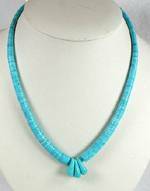 Often in heishi necklaces and other nugget necklaces, the turquoise has been stabilized. This means that a natural turquoise nugget has been treated with a stabilizing agent that closes the pores of the stone so it will not change color or fracture. This allows the artist to use smaller beads for necklaces; they would otherwise fracture if not stabilized. It also means your turquoise jewelry will look just as bright and beautiful years from now as from the day you purchased it. Natural turquoise, although beautiful, can change color when it comes in contact with body oil, hand lotion, soap or any other fat-based compound. Blue stones tend to become more green. Although all stones can fracture if treated roughly, natural stones tend to fracture more easily than stabilized stones. When a natural stone is used in a sturdy sterling silver setting, it is protected but when it is used as beads in a necklace, it could be easily chipped. That’s why most heishi and nugget necklaces use stabilized turquoise. Heishi necklaces are a perfect combo with summer weather, tank tops, V neck t-shirts…and there is nothing quite like a turquoise choker to highlight a tan ! There are so many wonderful colors and forms of stone and shell heishi, nuggets and beads, single strand to 25 strands, various lengths and of widely divergent styles that choosing a stone necklace can be somewhat overwhelming. There are so many wonderful Native American necklace choices, from heishi to silver beads, that choosing one can be a bit overwhelming. That’s why I am going to try to make your selection process a bit easier with some gentle guidance. The best way to choose a necklace is to measure a necklace you already have that fits like you want it to and is suitable for the way you want to wear it. For example, if you are shopping for a choker that you want to wear around your neck (as opposed to on top of a shirt or blouse), the measurement you will use will be a bit more critical because you want the choker to fit your neck and hang just the way you like it. Two people with the same neck size might choose two different size chokers. Some people like a choker very high and rather snug so might choose a 16″ choker while others don’t like the feel of a tight fit and like a bit of a drape to their chokers so might choose an 18″ choker. So get out your favorite necklace or take a piece of cord and test it out in front of a mirror. Wear it around for an hour or so to be sure that size is comfortable. Most adult women wear chokers in the 16-18 inch range. We try to keep a good selection in that size range in our store. Men usually wear chokers in the 18-20+ inch range. For some reason, that size range is difficult to find in Native American jewelry so we’ve had to special order a group of those for our male customers. The 21-22 inch necklaces can either serve as a choker or a necklace, depending on your size and wearing preference. If you are looking for a necklace, one that drapes longer or that you can use over your clothes or as a necklace to hang a pendant on, then you will want to put a necklace or test cord under your collar and decide where you want your necklace to hang. The choker or necklace that is perfect during the summer won’t fit over your turtlenecks and shirts in the fall and winter – so for over clothing, you’ll need to purchase one 1-3″ longer depending on the thickness of the fabrics you usually wear. Most women’s necklaces are in the 21-30 inch range. The length you choose will depend on your height (the length of your upper torso) and your personal preference for drape. Many necklaces can double as a place to hang a pendant so if that is your goal, be sure the fastener on the end is not too large so it will fit through the loop on the back of the pendant or through the or pendant bail. If you are using a pendant with a Shepherd’s Hook, this won’t be an issue. Native American made necklaces are priced according to the artist’s reputation, skill and ability and the materials they use. It is also based on the length of the necklace, so in effect, you pay by the inch ! But most importantly, you are paying for art – wearable art is priceless. One final piece of advice that we have learned first hand. When it comes to Native American jewelry, if you see something you like, you should purchase it because it may very likely not be available again. Unlike manufactured jewelry that is machine made and available in large quantities, Native American jewelry is make one piece at a time and although a particular artist might make a dozen of a particular necklace in one year, the next year, he or she might make none. The Santo Domingo, Navajo and Zuni artists are constantly creating new ways of using their traditional materials and designs to make beautiful jewelry. We have often had the opportunity to purchase, let’s say 5 or 6 of an item, but for one reason or another, we only took one or two but then when we tried to get more, there just were not any available! So it you like it, buy it ! If you have any questions, contact me at // orders@horsekeeping.com.